I honestly don't see how Google+ threatens Facebook. I don't think I'll ever use one OR the other. They'll be used in tandem. Does everyone you know shop at the same grocery chain? No. Which is why not everyone you know will use either Facebook or Google+ (or Twitter). They'll both grow and innovate. I'm sure 90% of their users will actively use other services as well. Now someone just needs to develop a super web app that puts all social network sharing and news feeds on one page ^_^. 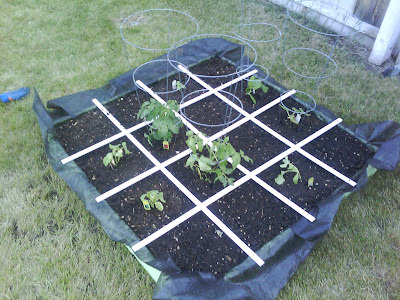 This one's got: zuchinni, squash, cantaloupe, honeydew melon, roma tomatoes, cherry tomatoes, and cucumber. This one's got: silver corn, jalapenos, spicy peppers, string beans, red onions, broccoli, cauliflower, and cilantro.